Keys missing randomly! Help please? First a little background about my setup. I'm on OSX 10.8 (Mountain Lion) with the nightly GPGTools installed (although this issue was in the other program as well). I have TrueCrypt volume that consists of the TorBundle (Vidalia and Browser). When I want to get on Tor, I mount the volume and then just launch the browser within it. TorBrowser is the main app I need to use GPG for, but for some reason when I highlight text, right click to services, and click Encrypt Selection, I get get a "Choose Recipients" screen that is blank (Screenshot below). My GPGKeychain (also below) seems to show them all just fine. This emptiness only happens in my TorBrowser though. I can get them all to show when I need it in Chrome (see below). My only guess is that it must have something to do with TorBrowser being in it's own independent volume. 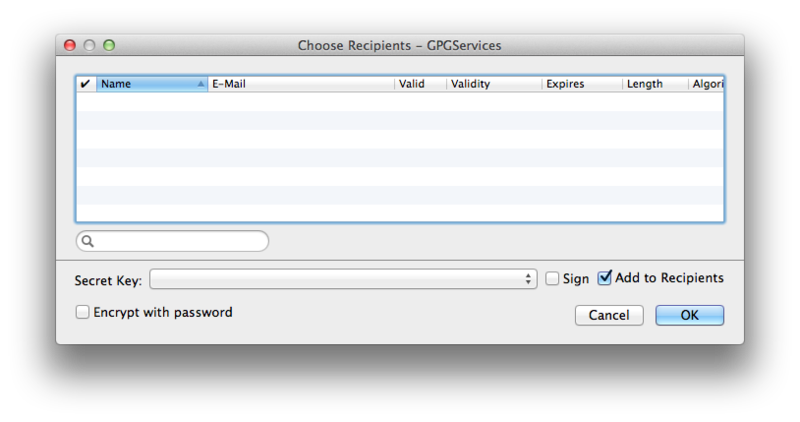 Does GPGServices look someone for the keys based on the location of the app it was launched on? Is there somewhere I could put a copy of my keys where GPGServices can see them when launched from TorBrowser? this might be very hard to track down. It might be OS X and services in general giving you a hard time with the TrueCrypt Volume and TorBrowser combination. 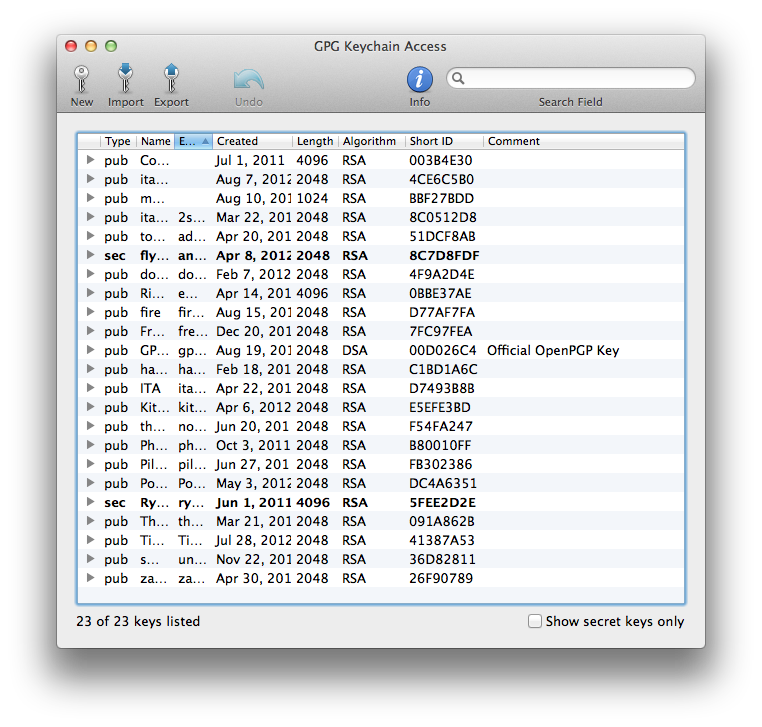 Would it be possible for you to simply to the en- and decryption process on your normal OS X setup and then copy / paste into your TrueCrypt volume? If you open console.app, do you see any errors or messages related to GPGServices? You've described my workaround. ;-) I've been opening up an instance of TextEdit and just encrypting the messages in there. Obviously this isn't ideal though. No errors related to GPGServices in the console. There is sometimes this odd edge case. After I encrypt something outside of TorBrowser, it will then work fine within it. The vice-versa is also sometimes true. When the recipients info is empty after I try it in the TorBrowser, it sometimes will be empty outside of it. It's really hard to pinpoint all of the exacts, but I can say that it will fail (empty list) 100% of the time if used in TorBrowser first. Very strange behavior indeed. We'd have to test this on our side. But this would be very low on the priority list. We need to get 10.7 final out and also 10.8 first alpha is an absolute priority currently.